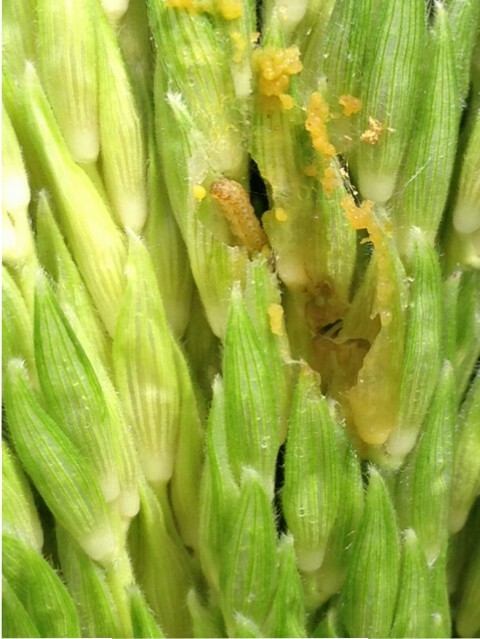 Sweet corn tassel with ECB larvae. fashion. The result is a planting where all plants do not reach full tassel at the same time. This situation may require an extra tassel spray if there are several days difference in the time full tassel is reached on a significant number of the plants. Insecticides that are acceptable in organic production include the spinosyn based material Entrust (IRAC-5) and Dipel (IRAC-11a). The 10G formulation of Dipel is particularly useful when granules can be dropped or broadcast such that they get into the whorls of corn plants. See the 2016 Commercial Vegetable Recommendations Guide for more insecticide choices. Corn earworm moth (CEW) captures in blacklights have declined this past week. This may be due to cooler evening temperatures as well as the normal decline of this early adult population. Present adult activity from blacklights is confined to the Delaware Bayshore (see CEW map). 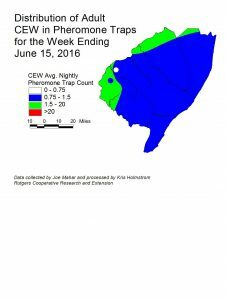 In addition, a limited number of CEW pheromone traps have been deployed throughout the southern counties. These traps have captured low numbers of CEW moths (see CEW pheromone map). The broad color patterns of this map are a result of the few numbers of contributing trap sites. As sweet corn plantings begin to silk, it is critical that growers monitor local CEW moth numbers. These early season moths target sweet corn exclusively and result in a level of damage that seems out of proportion to their numbers. For the present time, any sweet corn plantings entering the silk stage should be treated to limit CEW injury as well as to prevent ear damage from ECB larvae that already inhabit the stalks. Young pepper plants are at risk of infestation from this first ECB generation. Be sure to scout fields regularly for the presence of ECB egg masses. If two or more egg masses are found in a 50 plant (two leaves/plant) sample, consider treating even if no fruit are present. In the absence of fruit, ECB larvae will bore into the central stem, topping the plant. This will result in the loss of crown fruit on infested plants. Generally, where blacklight trap catches average one or more ECB per night (blue and green areas on the ECB map) and fruit are greater than ½” in diameter, insecticides are warranted. See the 2016 Commercial Vegetable Production Recommendations for materials useful in controlling ECB. No weevils have been trapped at the processing facilities that we are monitoring. So far, no weevils have been caught in monitored fields and there are no reported infested fields. 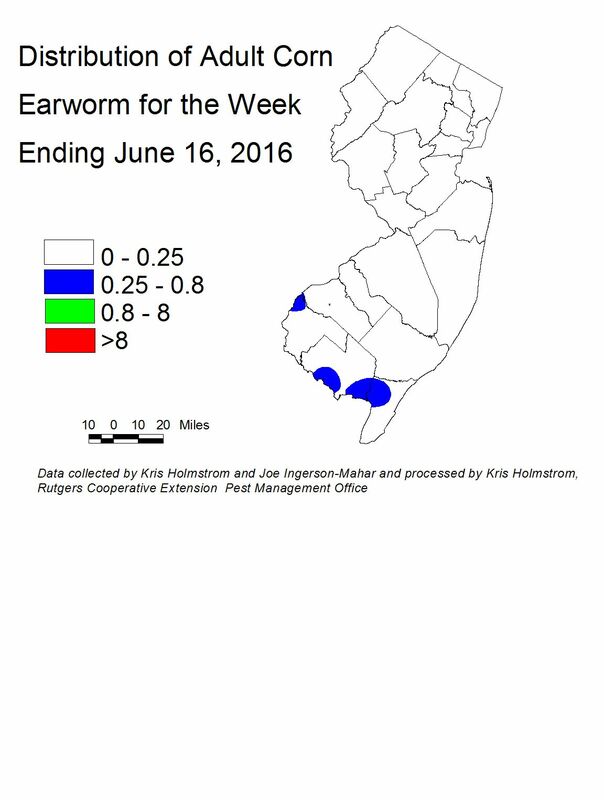 A few BMSB have been captured in NJ blacklight traps this week. Numbers are still quite low. As this pest increases, maps will appear in this newsletter.